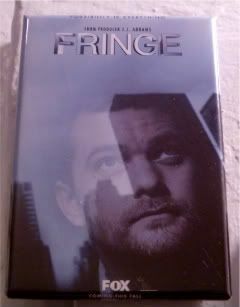 I picked up this one at Comic-Con a couple of months ago, and have been saving it for tonight's season three premiere of Fringe. By all accounts, it should be a pretty good one, now that the two universes are a little flip-floppy with folks having switched sides, with no real foreseeable way yet to right the two universes. My raison d'etre for watching this show has always been Joshua Jackson. I won't lie, if he weren't on this show, and such an integral part of the show, and come to think about it, really good in the Peter Bishop role, I'd totally have dropped Fringe from my TV dance card two years ago. But he is, so I'm still watching...and sometimes for more than just him. Actually, I found myself growing to like the alternative universe mythology of the show, and if we didn't have to deal with all the other X-Filesy stuff, I probably would like it more. I kinda wished I'd already picked up the S2 DVDs, just to do a quick refresher course before the premiere tonight, but I'm sure the extra long previouslys will get me through. Just the blurby-blurb reminded me of alterna-Olivia, and the Gaudi dotting the alterna-NYC skyline. So, yes. Let's see that again. Oh, and lots more Peter Bishop, too, please.